Home Electrical inspections Q&A: Are Minnesota home inspectors allowed to open electrical panels? Q&A: Are Minnesota home inspectors allowed to open electrical panels? Today I received a call from a local electrical contractor in <omitted>, MN. He decided he needed to call me and tell me that “I’m not a licensed electrician and I have no business removing electrical service panel covers” or testing outlets, etc as part of my inspection. He named some statute that states that you have to be licensed to inspect any electrical. I just listened and thanked him for the call. Sounded like he was a friend of a home seller who’s house I recently inspected with some electrical issues. Just curious what your understanding of this is? There’s a lot more to it than just that, but that’s the important part that has been brought into question. For the purposes of this discussion, home inspectors are typically unlicensed individuals. The obvious next question is “what constitutes electrical work?” For that, let’s turn to the definitions section for electrical work. “Electrical work” means the installing, altering, repairing, planning, or laying out of electrical wiring, apparatus, or equipment for electrical light, heat, power, technology circuits or systems, or other purposes. 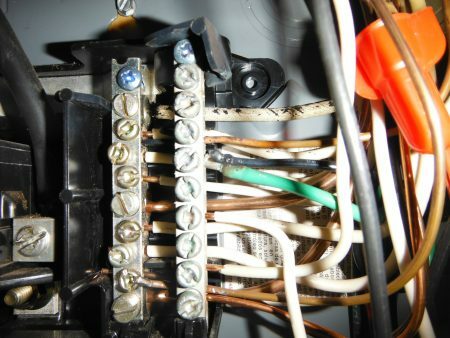 The installing, altering, repairing, planning, or laying out of electrical wiring, apparatus, or equipment for electrical light, heat, power, technology circuits or systems, or other purposes includes, but is not limited to, the performance of any work regulated by the standards referred to in section 326B.35. So there you have it. Removing an electrical panel cover to see inside the panel does not constitute electrical work. There is no rule or law in place that says that home inspectors can’t do this. The Standard of Practice of the American Society of Home Inspectors (ASHI) also requires the inspection of panel interiors. ASHI SOP (7.1.A.5) says the inspector shall inspect interior components of service panels and subpanels. As you stated in the headline. This is NOT a new story. I had the same experience with a state inspector at the annual building code officials meetings about 10 years ago. I was able to find the definition of “electrical work” and showed it to him later. His comments initially were part intimidation, and partly a caution about wearing personal protective gear to reduce the potential for injury from arc-flash. I also know that an ASHI inspector in Rochester MN had the same experience with a state inspector about 6 years ago. This myth seems to circulate every few years and has to keep being beaten down. Thanks for standing up to the mis-informed official. It doesn’t really mater what the ASHI Standards of Practic says. The only thing that matters is what does the Standards of Practice say for the stat that you are working in. I am Licensed as a Home Inspector in three State and I also work in a fourth state with no Home Inspector licensing. If the States Standards say that you are to remove the panel, then the State has made it perfectly legal for you to do so. And just for back-up you should have the direct cell phone number for the State Electrical Inspector handy in case any one wants to argue their side. I’m a retired electrician from Oregon. If I had hired you to do a home inspection, I would have expected you to remove the panel cover and check receptacles as part of the service. I don’t know how many home inspections resulted in my being hired to make repairs, but in 32 years it was many. Bottom line: there is no better insurance than a professional home inspection. In order to be an unlicensed individual like myself you need to be registered with the state of Minnesota that’s how you become a journeyman electrician. Not every person is an “unlicensed individual”. Another thing once you remove the cover to a panel and you INSTALL it back on. That is doing electrical work. Another thing he needed to not look up what is doing electrical work but what licenses you need to be an electrical inspector because the guy that called you originally stated “electrical inspecting” not doing electrical work. So yes you need to be licensed in order to do an electrical inspection.